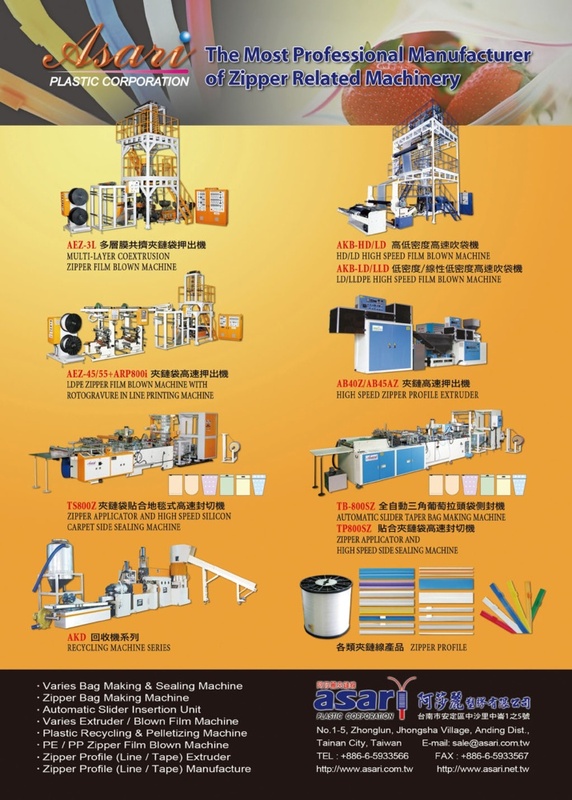 The company was founded in Los Angeles in 1989, mainly set up for the production of plastic products and manufacturing plastic machinery and later on transition to professional zipper profile production, manufacture and design of zipper related extruders, cutting and sealing machine. Over the past decade we had research and develop much zipper-related machinery and recognize with many patents. High-speed machineries and zipper profile are sold around the world such as America, Europe Japan and etc. Customers recognize our product with high appreciation. Asari P1astic Corporation mainly produces varies zipper profiles, PP/PE zipper profile extruder, PP/PE zipper film blown lines, multilayer extruders, recycling machines, Zipper Bag Making machine with attachment unit, Automatic slider bag making machine, Taper Bag making machine, and High speed T-shirt Bag Whole Plant equipment.